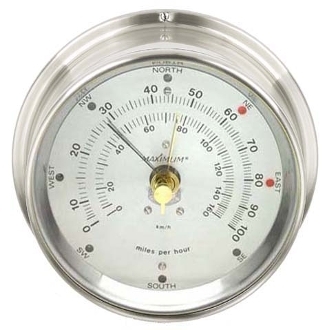 Maestro Wind Speed & Direction by Maximum, Inc.
Inspeed >> Maestro Wind Speed & Direction by Maximum, Inc.
Quality anemometer provides wind speed and direction in a digital, elegant brass package. 100 mph range. Four display modes include present, average, max, and forecast wind speed. Wind direction provided by 8 red LED's with 22.5 degree resolution. Self-powered wind speed generator = no power source or batteries needed. The turning rotor provides the power to move the needle. (An AC adapter is required for wind direction as described below). Wind direction displayed by 8 red LED's at 45 degree increments. 22.5 degree resolution comes when 2 adjacent LED's are lit simultaneously. The wind direction LED's are powered by an AC adapter. Comes complete with everything you need: wind sensor, wind vane, mounting brackets, 60 feet of wire, etc. You only need to provide a pole or chimney to mount it to. Longer wire available on request. Wireless Option - The Maestro is also available in a wireless model. This model features a wireless sensor with solar powered transmitter and NiCAD battery backup for up to 7 days without sunlight.